Annie was working with him on swimming strokes during a very calm Lake Michigan day. The water was so warm and Cam loved splashing in the lake. Cam's cousin James, whose birthday is only day after his, took the time to try to demonstrate some strokes for Cameron. Since all of the cousins were at the lake, there was an early birthday celebration for Cameron and James. 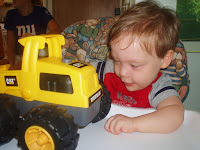 One of Cam's presents was a very cool "digger" which he definitely wanted to keep all to himself! The week included a special wedding for Erica & Tony. Jane used to babysit Erica. Annie stayed back at the cottage to babysit Cameron- thanks so much Anne! And many thanks to Grandma & Grandpa for having the family all week. 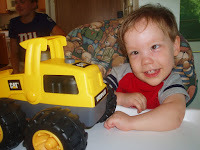 Even though Cam had a few early mornings, they still continued to smile and give their grandson lots of kisses!